Do you have any friends who drink all of their meals through straws? I am not talking about poor souls confined to hospital beds with impaired bodily functions, I am talking about healthy, active friends on your Facebook feed who’s every bi-hourly post is hyping their latest flavored shake that ‘tastes just as good as the real thing’ and ‘gives me the energy I need to entice all my friends to join my pyramid, err, marketing opportunity!’ I lovingly refer to this as the hospital bed diet, which seems to be only the latest of the never ending fad-diets. Well, I’d like to challenge them to come up with an avocado chipotle chicken salad shake every bit as good as my recipe! Kind of turns your stomach to think about, doesn’t it? I just don’t think some things are meant to be replaced. 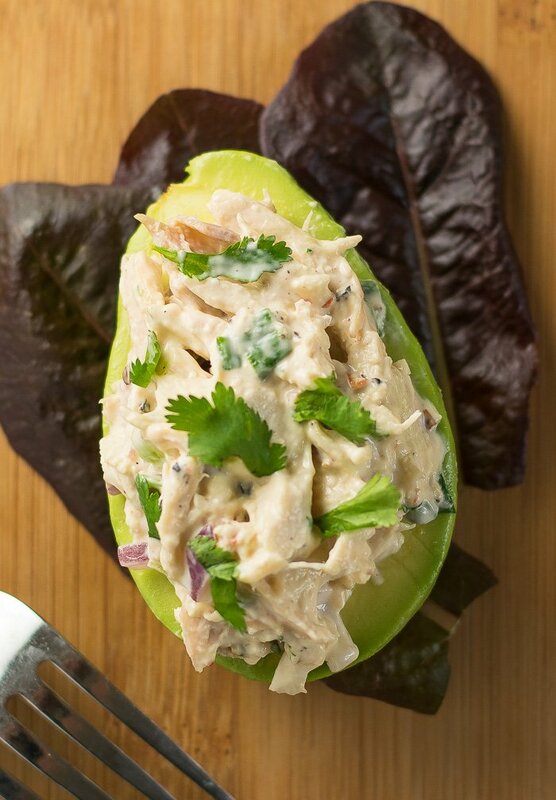 This avocado chipotle chicken salad is fresh, creamy, and full of contrasting textures that no shake can replicate. It is the perfect way to make use of a large, leftover batch of chicken salad. Sometimes you are just sick of the bun and you need a new way to eat it. The mild heat of chipotle peppers plays perfectly against the cooling creaminess of the avocado. This is actually making use of a chicken salad recipe I’ve already published, but I didn’t discover this delicious adaptation until I began re-purposing leftovers. Mixing chicken salad isn’t an overly difficult process, but I find a good, flexible, spatula is perfectly suited for the job. I was recently sent this kitchen tool set from Gourmet Boutique Chic and couldn’t be more happy with the quality. Its flexibility allows for gently combining ingredients without excessive mashing, and being made of silicone makes it heat resistant up to 500 degrees for your hotter tasks! Plus, I like any product that comes with a lifetime guarantee! The above link is an affiliate link. Any Amazon purchases made through this link will help support FoxValleyFoodie.com without any additional cost to you. 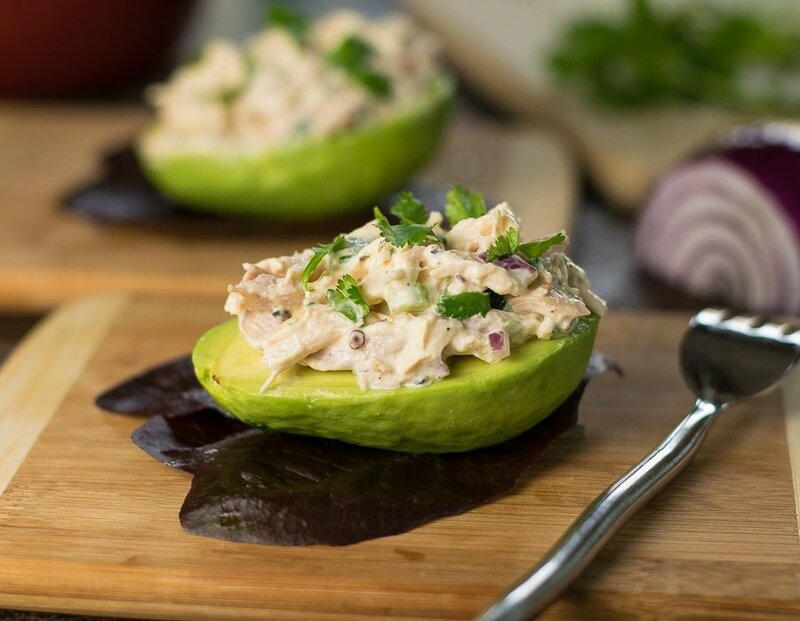 The deep smoky flavors of chipotle peppers and adobo sauce play nicely sitting on top the creamy, fresh avocados in this tantalizing Avocado Chipotle Chicken Salad. Shred the chicken and place in a large bowl. Add vegetables to the bowl with chicken. In smaller bowl add wet ingredients and seasonings and combine thoroughly. Pour mayo mixture over shredded chicken mixture and toss to evenly coat. Right before serving cut the avocado in half and place a healthy portion on each half of the avocados. Avocados brown quickly so I don't recommend cutting them any earlier than necessary. Rubbing any extra lime juice over already cut avocados will help prevent browning. 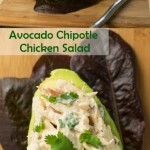 IF YOU LIKE THIS RECIPE be sure to check out my classic chicken salad recipe too! If you enjoyed reading my avocado chipotle chicken salad recipe then you should probably like me on Facebook and follow me on Pinterest too. That’s what I would do at least, because if you don’t get to know me but you still use my recipe it is kind of like taking candy from a stranger, and your mom taught you not to do that. Don’t disobey your mom, subscribe to Fox Valley Foodie today.